Another tasty recipe! And can easily put together after a busy day. 2 lb. bag of shells and veggie mix. Prepare shells as instructed on bag, Slice kielbasa to bite size and cook in saute pan. After kielbasa is cooked place cheddar cheese soup in saute pan and heat on low till hot. salt and pepper to taste. 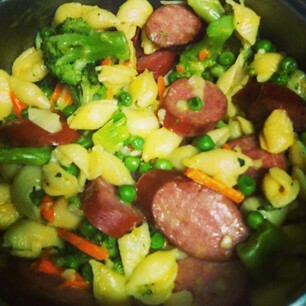 When shells are done drain and place back into same pot, add kielbasa mix and serve.